5Departamento de Industrias, Facultad de Ingeniería, Universidad Nacional de la Patagonia San Juan Bosco, Ruta Provincial N°1 Km. 4 (9000) Comodoro Rivadavia - Chubut - Argentina. & Contributed equally to this work. The yeast Yarrowia lipolytica accumulates oils and is able to produce extracellular lipases when growing in different carbon sources including glycerol, the principal by-product of the biodiesel industry. In this study, biomass production of a novel mutant strain of Y. lipolytica was statistically optimized by Response Surface Methodology in media containing biodiesel-derived glycerol as main carbon source. This strain exhibited distinctive morphological and fatty acid profile characteristics, and showed an increased extracellular lipase activity. An organic source of nitrogen and the addition of 1.0 g/l olive oil were necessary for significant lipase production. Plackett-Burman and Central Composite Statistical Designs were employed for screening and optimization of fermentation in shaken flasks cultures, and the maximum values obtained were 16.1 g/l for biomass and 12.2 Units/ml for lipase, respectively. Optimized batch bioprocess was thereafter scaled in aerated bioreactors and the values reached for lipase specific activity after 95 % of the glycerol had been consumed, were three-fold higher than those obtained in shaken flasks cultures. A sustainable bioprocess to obtain biomass and extracellular lipase activity was attained by maximizing the use of the by-products of biodiesel industry. Keywords: Yarrowia lipolytica mutant; Biomass; Lipase; Fatty acids; Glycerol. Optimización de la producción de biomasa usando glicerol crudo, de una cepa mutante de Yarrowia lipolytica con actividad incrementada de lipasa. La levadura Yarrowia lipolytica acumula aceites y produce una lipasa extracelular al crecer en diferentes fuentes de carbono, entre ellas el glicerol, principal subproducto de la creciente industria del biodiésel. En el presente trabajo, se optimizó mediante la metodología de superficies de respuesta la producción de biomasa de una nueva cepa mutante de Y. lipolytica, empleando medios con glicerol derivado de la industria del biodiésel como principal fuente de carbono. Esta cepa presentó características morfológicas y perfil de ácidos grasos distintivos, y una mayor actividad de lipasa extracelular. Para obtener una producción significativa de lipasa extracelular, fue necesario el agregado de una fuente orgánica de nitrógeno y de 1 g/l de aceite de oliva. Se utilizaron los diseños estadísticos de Plackett-Burman y central compuesto para la selección y la optimización de las fermentaciones en frascos agitados; los máximos valores de biomasa y de lipasa obtenidos fueron de 16,1 g/l y 12,2 unidades/ml, respectivamente. Luego, el bioproceso en lote optimizado se escaló a biorreactores aireados, y los valores de actividad específica de lipasa alcanzados después de haberse consumido el 95 % del glicerol fueron tres veces más altos que los obtenidos en los cultivos en frascos agitados. En suma, se desarrolló un bioproceso sostenible para la obtención de biomasa y de una actividad de lipasa extracelular, que a la vez maximiza el uso de subproductos de la industria del biodiésel. Palabras clave: Mutante de Yarrowia lipolytica; Biomasa; Lipasa; Ácidos grasos; Glicerol. The yeast Yarrowia lipolytica presents reversible dimorphism (unicellular-filamentous growth) as well as extracellular lipase production, which is dependent on different environmental factors, being also strain-specific (2, 5, 17, 19, 20, 21, 28, 35). This "non-conventional" yeast is considered a single cell oil producer because it is able to accumulate oils intracellularly (9); it is strictly aerobic and is able to metabolize industrial and agro-industrial by-products and to produce metabolites of interest (15, 22, 23, 29). Y. lipolytica strains also have the ability to produce extracellular and cell-bound types of lipases of great industrial interest because of their application in detergent, food, pharmaceutical and environmental industries (13, 16). Lipase productivity is affected by several factors, such as carbon and nitrogen sources and available oxygen levels (7). It has also been reported that lipase activity produced by yeasts remains bound to the cell wall and it is released to the culture medium in the stationary phase of growth, when the carbon source has been exhausted (25). Currently, with the growing demand of biodiesel in a worldwide large commercial scale, enormous quantities of waste glycerol are likely to be generated in the near future. Taking into account that glycerol is also produced as a by-product by several other industries, the conversion of this renewable feedstock to high-value added products attracts much interest. Although glycerol is mentioned as one of the usual carbon sources for lipase production (19), few authors have reported the use of glycerol derived from biodiesel for the production of microbial metabolites and biomass (24), and even fewer authors, such as Volpato et al. (32, 33) reported about lipase production with raw glycerol as main carbon source, by using the bacterium Staphylococcus warneri. On the other hand, it is well known that optimization of a bioprocess plays a pivotal role when production of a metabolite or enzyme at an industrial scale is desired. Statistical optimization of any biotechnological process, where interactions between factors are expected, yields more reliable information per experiment than unplanned approaches. This stepwise methodology involves the selection of a potentially large number of input variables (Screening Designs) and then, the optimization of the bioprocess using a reduced selected number of variables, typically making use of Central Composite Designs (CCD) and Response Surface (RSM) analysis (30). The main objective of this work was to optimize a sustainable bioprocess for biomass production of a new mutant of the GRAS yeast Y. lipolytica (2, 16), by taking the most of the biodiesel-derived glycerol. The mutant strain selected maintained the yeast morphology, presenting a distinctive fatty acid profile and produced an increase in extracellular lipase activity (LIP). The microorganism used was a chemically-induced mutant of Y. lipolytica NRRL Y-1095 (see below), deposited in the Culture Collection (Facultad de Ciencias Exactas y Naturales-University of Buenos Aires-Argentina) under accession number BAFC 3852. Chemical mutagenesis of Y. lipolytica NRRL Y-1095 with N-methyl-N'-nitro-N-nitrosoguanidine and screening for extracellular lipases were carried out as described in (12). The mutant strain was obtained after three rounds of mutagenesis. Yeast cultures were maintained in agar Sabouraud slants at 4 °C for routine assays. For inoculation, a loopful of the cultures was transferred to 20-ml YNB (Difco, Becton Dickinson Co. Sparks MD 21152-USA) broth containing 2.0 % (w/v) analytical glycerol (Merck Química Argentina) as carbon source, and incubated in Erlenmeyer flasks for 24 h. All Erlenmeyer flasks cultures herein described were carried out at 28 ± 1 °C, with agitation (200 rpm) provided by an orbital shaker, and keeping the ratio "volume flask: volume medium" in 5:1. After the incubation periods, aliquots of the cultures were washed twice with sterilized distilled water by suspension and centrifugation prior to their inoculation in the experimental flasks at a final concentration of 1.0 x 106 cells/ml. Unless indicated, all culture media herein described contained 1.0 g/l of the surfactant Tween 80 and 1.0 g/l of a commercial olive oil (OO) as LIP inducer. Culture media to study the effect of the nitrogen sources on LIP production were those proposed in (7) with glycerol (2 %, w/v) as carbon source, except that pH was kept at 7.0 with phosphate buffer 0.1M, containing different nitrogen sources. The nitrogen sources evaluated were (in g/l): 2.0 and 10.0, urea; 10.0, yeast extract (YE); 4.0, (NH ) SO ; 10.0, meat peptone (peptone) or tryptone from casein (Merck Química Argentina). In these experiments, biomass and LIP were determined at 48 h incubation. The experimental designs were carried out in shaken flasks cultures. Culture media were prepared by dissolving the selected solutes in phosphate buffer (pH 5.0 to 7.0) at the concentrations given by the design matrices (see Results and Discussion). For bioreactor assays, batch fermentations were carried out in a 5-l New Brunswick FS300 baffled fermenter (New Brunswick Scientific Co., NJ-USA), with two flat-bladed turbines with six blades (Rushton turbine). The fermenter was equipped with controllers for pH, temperature, agitation and dissolved oxygen concentration. The fermentation media (3.5-l) contained 10.0 g/l glycerol and 5.0 g/l peptone dissolved in phosphate buffer at pH 7.0. Agitation and aeration were varied to maintain dissolved oxygen concentration at 40 % air saturation. Foam production was controlled by addition of antifoam (Antifoam 289, Sigma, Saint Louis, MO, USA). Inocula were carried out essentially as described for Erlenmeyer flasks, except that the liquid medium for the inoculum was the same as for the fermenter. Aliquots of 30 ml culture were withdrawn at the times indicated, for cell dry weight (CDW), LIP and remaining glycerol determinations. Pretreatment of raw glycerol from biodiesel production was done as described by Chi et al. (6). The product obtained (pretreated raw glycerol, PRG) contained 47 % (w/v) of authentic glycerol. Fatty acids (FA) were also recovered after the pretreatment of raw glycerol and tested as LIP inducers, at 0.0, 0.1, 0.3, 1.2 or 2.4 g/l concentrations. The ITS1 gene sequence, 5.8s ribosomal RNA and ITS2 gene sequences of the mutant strain were obtained and compared with those of the parental one. For that purpose, one colony of the parental strain and another of the mutant strain were transferred and grown in Erlenmeyers flasks containing the medium used in the fermenters (see below). DNA was extracted using the UltracleanTM Microbial DNA isolation kit, (MoBio Laboratories, Inc). The ITS region was amplified using primers ITS1 and ITS4 and PCR program followed the condition described in (34). Amplified products were visualized by electrophoresis in 1 % agarose gels, Gel red BiotiumTM stained and purified using the Pure link purification kit (Invitrogen®). Both chains were sequenced using primers ITS1 and ITS4 in an ABI I sequencer at the Servicio de Secuenciación y Genotipificado, FCEN-UBA. Biomass production was monitored gravimetrically as CDW (g/l) in aliquots of 10.0 ml culture samples. Alternatively, it was determined as cell concentration (cells/ml) using a Neubauer chamber. The fatty acid content of the cells was determined after its extraction from biomass with n-hexane, being previously submitted to direct transesterification (18), and subjected to gas chromatography/flame ionization detector (GC/FID) (HP 5890A, Hewlett-Packard Co., Palo Alto, CA,USA) on a capillary column (Variant FactorFour VF-23ms, 30m x 0.25mm x 0.25 mm) with temperature programming (initial temperature of 120 °C during 5 min, followed of a gradient of 3 °C/min to 220 °C, 5 min final time) and helium as carrier gas (0.6 ml/min, split 15:1). Nonadecanoic acid (19:0) from Sigma, St Louis MO, USA was used as internal standard for quantitative purposes, and the standard FA mix 569 from Nu-Chek Prep, Inc., Elysian, MN, USA was used for identification of individual fatty acids. LIP activity was assayed and expressed as volumetric activity in Units/ml culture (U/ml) according to (10). One Unit was defined as the amount of enzyme releasing 1 µmol of fatty acids per minute at 37 °C and pH 7.2. LIP stability in organic solvent assays was carried out according to (8). Glycerol content in samples was analyzed enzimatically (Boehringer-Mannheim./.R-Biopharm, AG, D-64293 Darmstadt, Ger.). Plackett-Burman screening designs (PBSD) (26) for five factors, with two coded levels (-1 and +1) and three center points, were run to evaluate the linear effects of concentrations (Xi) of: glycerol, (NH ) SO ¸ Mg SO , mineral solution (4), YE, peptone and pH values responses were determined at 48, 72 and 96 h. Results obtained were fitted with a first-order model. where xi and Xi are the dimensionless (codified) value and the actual value of an independent variable, respectively, X0 is the real value of an independent variable at center point and ∆Xi is the step change. where, Y is the predicted response, xi xj are the input variables influencing the response variable Y, b0 is the intercept, bi is the ith lineal coefficient, b is the ith quadratic coefficient and bij is the the ijth interaction coefficient. Statistical and numerical analyses were carried out by means of the analysis of variance (ANOVA) and multiple regressions using the software Essential Regression v.2.205, Mathematica v. 3.0 and Origin v. 6.0. Sequences of the ITS region of the mutant strain presented 100 % of homology with those of the parental and other strains of the same species deposited in GenBank, confirming that the BAFC 3852 strain, herein developed, is a mutant derived from Y. lypolitica NRRL 1095. The mutant strain grown in the medium used in the fermenter (see Materials and Methods) maintained a unicellular yeast morphology all along the growth and LIP phases production considered, even in the range of pH between 5.0 and 7.0. 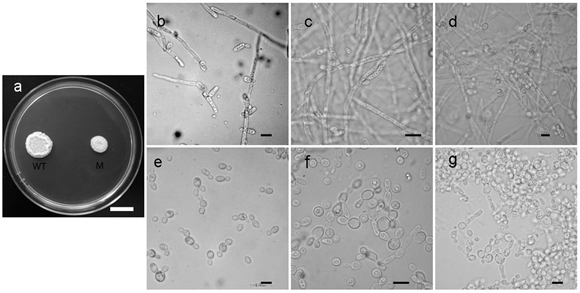 On the other hand, the parental strain exhibited a cell morphology in which true mycelium and pseudo-mycelium were predominant, in contrast with the few short germinative tubes exhibited by the mutant strain; these morphologies are reflected in the colony appearance (Figure 1). Figure 1. Colonies of Yarrowia lipolytica after 72 h growth in Sabouraud agar (a): on the left, strain NRRL 1095 (WT, parental strain) and on the right, strain BAFC 3852 (M, mutant strain). Cell morphology of Yarrowia lipolytica strains grown on 10.0 g/l glycerol and 5.0 g/l peptone dissolved in phosphate buffer at pH 7.0: upper row, strain NRRL 1095; lower row, strain BAFC 3852, at 20 h (b, e), 48 h (c, f) and 72 h (d, g). Bars represent 1 cm in panel (a) and 10 mm in panels (b-g). Since unicellular morphology represents a significant advantage when the growth of a microorganism in an aerated bioreactor is proposed, we selected this strain for fatty acid and LIP activity characterization. Ruiz-Herrera and Sentandreu (28) analyzed the environmental factors that affected the dimorphism of the fungus Y. lipolytica in a wild-type strain and in an auxotrophic mutant. They reported that mycelium formation was maximal at pH near neutrality and became almost null at pH 3. On the other hand, Makri et al. (21) reported that the morphology of yeast Y. lipolytica grown on glycerol was growth phase-dependent. In batch cultures performed in laboratory scale bioreactors, they found that short true mycelia and pseudo-mycelia were predominant during the exponential growth phase. A biochemical characterization of the mutant strain with respect to lipid accumulation and composition showed that this mutant produced more than 35 % of the total fatty acids (standardized by dry biomass) over the parental one after growing in glycerol or glucose based media (6.37 vs 4.69 or 9.14 vs 6.57 % w/w, respectively), after 48 hour incubation. Moreover, the mutant strain growing in glycerol-based medium exhibited several diagnostic characteristics. Firstly, a decrease of ca. 25 % in the ratio of unsaturated to saturated fatty acids compared to that obtained in a glucose-based medium, a behavior which was not observed in the parental strain. Secondly, it presented a distinctive fatty acid profile (i.e., it did not produce palmitoelaidic acid (16: 1, 9-trans) and also showed an increase of saturated fatty acids 18:0, 20:0, 22:0 and unsaturated fatty acids 22:4 (from the w-6 series) significantly higher, being this increase produced at the expense of the decrease of fatty acids 10:0, 16:0, 16:1 synthesis, as depicted in Figure 2. Figure 2. Fatty acid profiles of strains BAFC 3852 (mutant strain) and NRRL-Y-1095 (parental strain) grown in glycerol or glucose as carbon source. Previous experiments in our laboratory had shown that LIP activity (as well as that associated to the cells) produced by the mutant strain in a medium containing glycerol as main carbon source, peaked at the beginning of the stationary phase of growth (36 h) when the carbon source became limiting (data not shown). Similar results were reported by Fickers et al. (13, 14) for lipase production by Y. lipolytica grown on several carbon and nitrogen sources. The LIP activity expressed in U/ml largely doubled that associated to yeast cells, being also 3-4-fold higher in the mutant strain when compared to that of the parental strain at 24 h incubation (exponential growth phase), and 2-fold higher at the beginning of the stationary phase. When specific LIP activity (U/mg CDW) was considered, the enzyme activity of the mutant strain was more than 5 times higher at 24 h.
Another very important characteristic of the mutant strain was that its LIP activity was five times higher (2.0 vs 0.4 U/ml) when both strains were grown in a medium containing glycerol (2.0 % v/v) as sole carbon source at 48 hour incubation. Taking into account the biochemical characteristics of this mutant (mainly the higher LIP production and its reduced sensitivity to glycerol repression) as well as its biotechnological advantages that correlated with its yeast stable morphology, this strain was selected to carry on with this work. Thus, the optimization of LIP-producing biomass of the mutant strain obtained was studied in shaken flasks cultures, intending to scale the bioprocess. As Y. lipolytica is highly recommended for lipase production (19), conditions that encouraged both biomass and LIP production were analyzed. Preliminary PBSD experiments demonstrated that up to 48 h incubation, 20.0 to 60.0 g/l glycerol provided by PRG; 0.0 to 1.0 g/l MgSO4; 0.0 to 5.0 ml/l mineral solution and pH (5.0 to 7.0 units) did not significantly affect either CDW or LIP production. Addition of (NH4)2 SO4 (0.0 to 6.0 g/l) and YE or peptone (0.0 to 2.5 g/l) significantly increased cellular growth, but LIP production was significantly (p < 0.05) increased only by YE or peptone addition. The effect of organic as well as inorganic nitrogen sources on LIP production was particularly evaluated, as different results have been reported in the literature (1, 14, 22, 31). Figure 3 shows the LIP production of the mutant strain of Y. lipolytica grown in the presence of different nitrogen sources. The results obtained clearly suggest that the presence of organic nitrogen sources (peptone, tryptone or YE) increased LIP activity with respect to the addition of inorganic compounds such as urea, or (NH4)2 SO4 (data not shown). Taking into account these results, it was considered that, tryptone or YE could be used indistinctly as nitrogen sources for both LIP and biomass production. Figure 3. 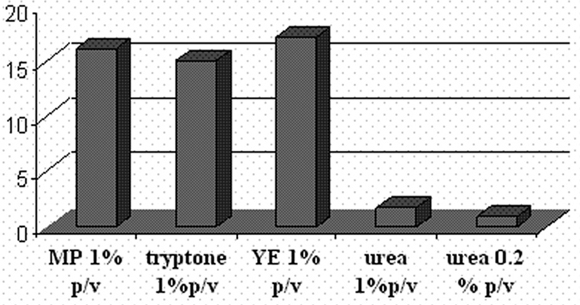 Effect of nitrogen source (meat peptone (MP), tryptone, yeast extract (YE) and urea) on lipase activity (LIP). Data are the mean values of two independent experiments. To further optimize the productivity of the bioprocess, CCD experiments were carried out. The selected variables assayed as the results of the previously performed PBSDs, were glycerol and peptone concentrations and incubation times.These variables were chosen mainly for two reasons: firstly, because they have the highest incidence in the process economy and secondly, because one of the main objectives of this work was to biotransform the highest possible amount of raw glycerol into cell mass. Following successive rounds of optimization, the design performed and the response obtained for CDW are shown in Table 1. 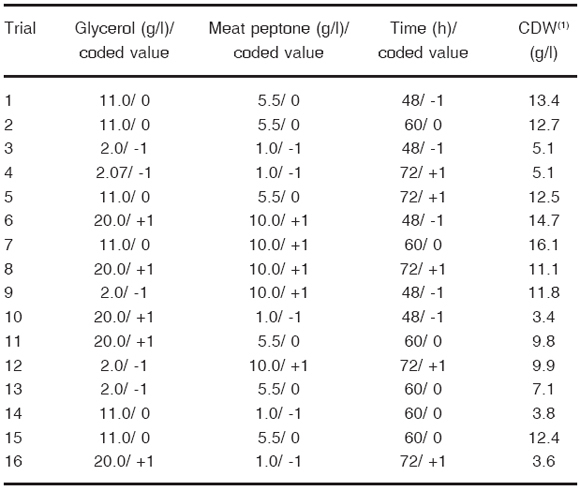 Table 2 shows that the regression coefficients indicated that the peptone content had a significant linear effect (p < 0.05) and its large value showed that it was the most important variable influencing the response, while the quadratic coefficient value was equal to -0.092 (p < 0.1). On the other hand, glycerol had a positive linear coefficient and significant effect (p < 0.1) on CDW production; the quadratic term was also significant (p < 0.05), and its negative value suggests that the CDW reaches a maximum value (mathematically optimized) of 17.1 g/l, at 13.0 g/l glycerol, 10 g/l peptone and 48 h fermentation. Moreover, no significant interactions were observed. The value of the coefficient of determination (R2 in Table 1) indicated that only 5 % of the total variation was not explained by the model, which means a high significance of the model. Furthermore, the lack of fit was not significant, which means that the model included all the appropriate functions of the independent variables. The experimental behavior depicted in Figure 4 was obtained by applying Response Surface plots as function of the two main medium components influencing CDW production. 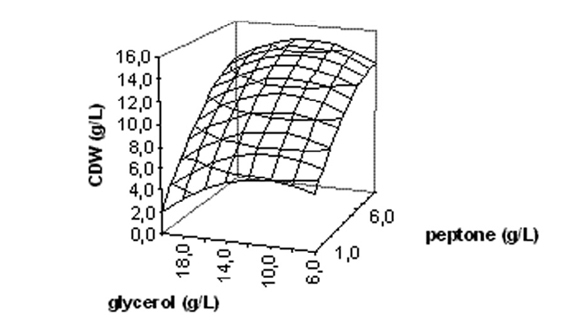 Biomass levels for different concentrations of glycerol and peptone can be predicted from this plot. The maximum predicted production for CDW is indicated by the surface confined in the response surface diagram. Figure 4. 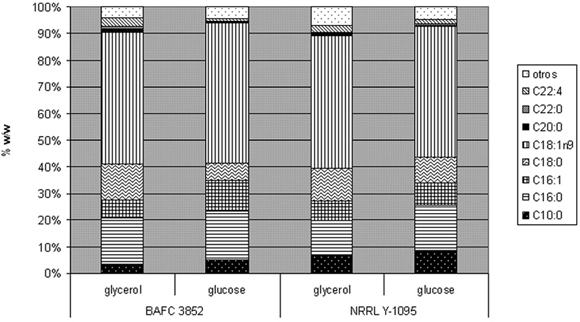 Response Surface plot showing the effect of glycerol and meat peptone on yeast biomass production (CDW). The results of the validation experiments proved the applicability of the model. The predicted response for CDW (g/l) was 17.11 and the actual response was 17.84 for 13.0 g/l glycerol, 10.0 g/l peptone and 48 h incubation. In the same conditions as those described in CCD for CDW production, none of the estimated coefficients for LIP production were statistically significant (p > 0.05), but it is worth noticing that maximum yeast CDW obtained yielded 12.2 U/ml LIP. As previously informed, lipase activity produced by Y. lipolytica is strongly dependent on strains as well as on media composition and yeast morphology. Fickers et al. (9, 10, 12, 13, 14) reported extracellular lipase activities obtained from the yeast Y. lipolytica ranging from 10 to 3000 U/ml using several mutant strains and different nitrogen and carbon sources (other than glycerol). Fickers et al. (11) also reported that the level of lipase production could be modulated by the cell morphology in Y. lipolytica, and that cells tended to adopt a hyphal morphology up to an average value of 80 % at the end of the fermentation. On the other hand, Corzo and Revah (7) obtained maximal LIP activities of ca. 32 U/ml, in optimized cultures of Y. lipolytica containing glucose as carbon source. Volpato et al. (32), when studying the optimization of LIP production by a strain of Staphylococcus warneri in a culture medium containing raw glycerol, obtained a lipase activity of 0.1273 U/ml and reported an optimal concentration of 30 g/l raw glycerol. Briefly, our results for LIP obtained from a yeast grown in glycerol, agree with existing data from the literature. It is worth pointing out the relevance of using a GRAS microorganism such as Y. lipolytica in an industrial process. Taking into account the results obtained in shaken flasks cultures, experiments were then conducted in a bioreactor improve the biomass production of this novel mutant yeast, in order to get the most of the utilization of PRG. Assays were performed in an aerated fermenter in a medium formulated according to the current values obtained by the CCD trials. Culture samples were taken at 24 h, 48 h, 60 h and 72 h fermentation for CDW, LIP and glycerol determinations (Figure 5). Yield values obtained were between 0.9 to 1.0 g CDW/g glycerol consumed. Makri et al. (21) reported yields of ca. 0.97 CDW/g glycerol consumed when growing Y. lipolytica on glycerol in bioreactor repeated batch cultures. It has to be noticed that LIP was produced in the stationary phase of growth when more than 95 % glycerol had been consumed. Accordingly, Corzo and Revah (7) reported that although glycerol is an end product of the hydrolysis of triacylglycerols and it may repress lipase induction, it did not significantly inhibit the activity of lipase when glycerol was tested in the enzymatic reaction medium at concentrations ranging from 0.5 to 6.0 g/l. Figure 5. 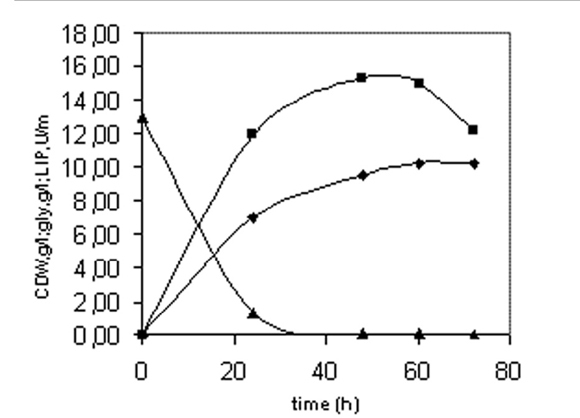 Batch culture in a 5-l batch bioreactor showing extracellular lipase activity (n), yeast biomass concentration CDW) (t) and glycerol concentration (w) in the fermentation medium. Each point represents the average value of at least two independent fermentations. The enzyme specific activity, expressed as LIP/CDW units was three-fold higher than that obtained in shaken flasks run under similar conditions, (1.61 vs. 0.55) which could strongly suggest that the specific LIP volumetric production increased with aeration. These results are in good agreement with those reported by Volpato et al. (32), who determined that lipase produced by Staphylococcus warneri in submerged bioreactors using glycerol from biodiesel, was five times higher than that obtained in shaken flasks cultures. Later, Rech et al. (27) reported the enhacement of lipase production in similar bioreactor cultures of S. warneri, using an oxygen carrier (polydimethylsiloxane) to improve the oxygen transfer mechanisms. Besides, Lopes et al. (19) also reported the enhancement of lipase production by Y. lipolytica, in batch cultures on glucose medium under increased air pressures, due to oxygen transfer rate improvement. Preliminary results had demonstrated that the addition of OO as a LIP inducer from the beginning of the fermentation process was necessary to induce enzyme production. In order to improve the economy of the process, FA obtained during raw glycerol pretreatment were tested as LIP inducers instead of OO. The results obtained after 48 h incubation showed that LIP volumetric production, when 2.4 % (v/v) FA were added, represented 66 % of the same parameter obtained with 0.1 % (v/v) OO. These results are encouraging in order to implement different biodiesel-derived glycerol purification methods to use partly purified raw material for LIP production. The use of by-products of the biodiesel industry can not only improve the process economy but also its sustainability, even if higher FA concentrations were required for LIP induction. Besides, addition of FA to the production medium also increased CDW concentration by 14 %. To study the effect of organic solvents on the LIP produced in the bioreactor by the mutant strain, ethanol and n-hexane were respectively tested as representatives of industrially used hydrophilic and hydrophobic solvents. Although little LIP activity (up to 0.2 fold) remained after ethanol treatment, it increased 1.8 fold after incubation with n-hexane, as compared with control assays. Dheeman and Frias (8) reported that water immiscible hydrophobic solvents generally cause less inactivation on lipase activity than water miscible hydrophilic ones. Under similar conditions to those herein used, they observed a significant activation of an extracellular lipase obtained from a strain of Amycolatopsis mediterranei, after 1 h incubation in p-xylene and n-hexane. Although further studies are required, the results herein obtained suggest that the LIP produced by this new mutant could represent a good candidate to be employed in non-aqueous biotransformations. To conclude, it can be said that the optimization of the fermentation bioprocess enabled us to perform a sustainable bioprocess in a bioreactor to obtain high value-added products by maximizing the use of the quantitatively most important wastes of the biodiesel industry. On the other hand, when compared with the parental strain, the Y. lipolytica mutant herein obtained presented morphological advantages and better performance for obtaining both LIP and single cell oil in bioreactor systems for larger scale productions. Acknowledgements: We wish to thank Dr C. Kurtzman, ARS Culture Collection (USDA), for the generous gift of Y. lipolytica NRRL Y-1095; Dr. D. Romano (Facultad de Ingeniería-UBA) for gently providing us samples of biodiesel derived glycerol; and to the Universidad de Buenos Aires-Ciencia y Técnica (Grant I040) for funding this work.